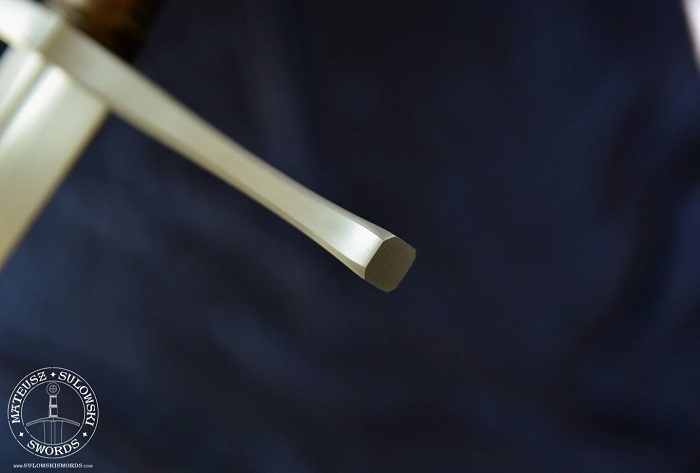 Blade width at cross is 48 mm (2”) and the blade has a distal taper from 5.5 mm down to 3mm near the tip. When I first saw the photos of this sword I was pretty excited. Of course I’d seen work-in-progress shots and agreed the design but this just epitomised to me what a sword of this type should be like. Of course I wondered if the sword itself would live up to the pictures and, you know what, it really does. 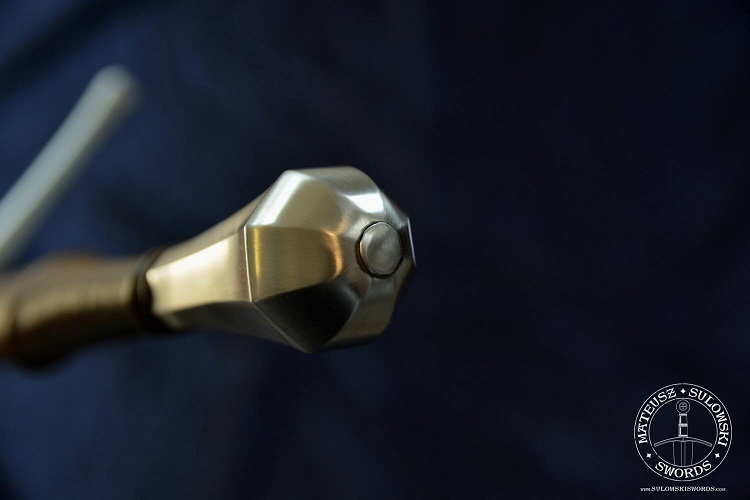 I’ve not handled enough swords to know how this compares to other high-end production swords (or to original artefacts) but I can tell you it is the stunning, functional, understated and finely crafted tool I hoped it would be. I’d expect a type XVIa to be an all-rounder, capable of decent cutting performance but with enough rigidity in the blade to be strong in the thrust. There’s certainly an acute point, blade stiffness, and good point control, and I suspect this particular sword is a little more inclined towards the thrust. However, some cutting practice (albeit only with water filled bottles) suggests reasonable cutting performance too. Whilst the blade is not particularly authoritative and overall weight is at the low end for overall size, there is just a speed and agility that makes rapid cuts and recovery seem easy. That said, it would perhaps struggle against more substantial targets but I’m assuming if ever used in anger, my adversary would be too busy admiring the damned thing to put up much of a fight! Build quality looks very solid and the hilt components (cross, grip and pommel) are all very well executed. The pommel in particular is really nicely done, and the peen is neat, without trying to hide. Blade form looks good with nice clean fullers and an even and sharp (but not razor sharp) edge. 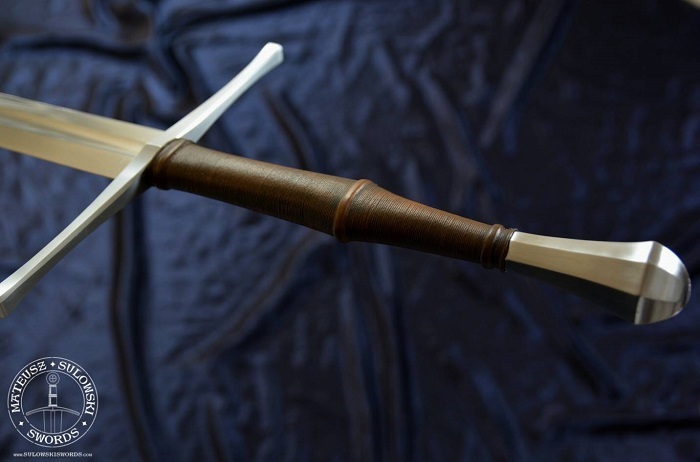 Since I couldn’t afford the option for one of Mateusz’s scabbards, my challenge now will be to make one myself that does justice to this fantastic sword – to be posted on the DIY scabbard thread if I ever deliver the goods! So in summary … a really great piece and just what I always wanted! 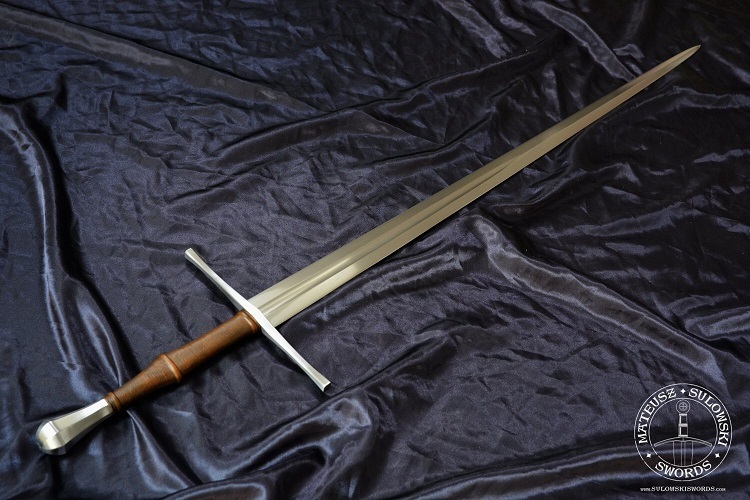 This is indeed a gorgeous sword - even if I prefer shorter grips for this kind of blade (my ideal sword with this blade would be about 112cm with an about 21/22cm handle). Lucky guy! I wonder what its dynamic properties look like. Wow. That's a gorgeous looking sword. What kind of steel did he use? How's the sharpness? And most importantly, how much did it cost you? Yet another glowing review for Mr. Sulowski gives me even further justification that my next historically-based replica will be made by his careful hands! Don't lose a finger or anything before that Mateusz Sulowski! To answer your first two questions, I understand Mateusz used a 6150 chromium vanadium steel and the sword came sharp, but not razor sharp. Its certainly sharp enough to cut light targets (water-filled bottles/cartons), especially since its very fast/agile, but I guess some people might prefer a slightly sharper edge. I've not tried cutting anything more challenging. No offence but I'd rather not talk about cost and I know Mateusz prefers to discuss prices 1:! with his customers - I'm sure if you were interested in something similar he'd be happy to give you an indication of prices - he's very responsive to messages. Congratulations on a fine acquisition. The sword I have from Mateusz is one of my favorites and surely won't be my last. The quality to cost ratio is outstanding.